TIG-160DC is a rectifier adopting the most advanced inverter technology. Welding power source can offer stronger, more concentrated and more stable arc. When stick and work piece get short, its response will be quicker. It means that it is easier to design into welding machine with different dynamic characteristics, and it even can be adjusted for specialty to make arc softer or harder. The machine can be for multi-use, and can weld stainless steel, carbon steel, copper and other color metal, and also can use for traditional electric welding. 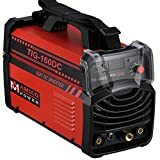 Specification • Processes: TIG (GTAW), STICK, ARC, MMA • Input Power: 110/230V/1phase/60Hz • Output Range: DC 20-160 Amps • Input Current: 37A(110V) & 25.8A(230V) • Rated Output: 25.2V & 26.4V • Duty Cycle: AC 230V/160A@60% & AC 110V/130A@60% • Dimensions: 16.6 x 7.5 x 11.8 inch • Product Weight: 14.5 Pounds What’s Included • TIG-160DC TIG/Stick/ARC Machine • Professional TIG Torch Gun and Assembly 13 feet • Electrode Holder and cable10 feet • Work Clamp and cable10 feet • 110V and 230V Transfer Plug • 2 pieces of Electrode 1/8 in. • 2 pieces of Electrode 3/32 in. • 2 pieces of Tungsten 1/16 in. • Instruction Manual. 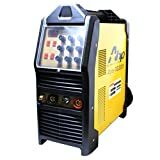 Ac Dc Tig 140 Amp Welder. TIG-205 can weld Steel, Stainless steel, Alloy steel, Mild steel, Nickel alloys, Copper, Brass, Bronze, Cast Iron and Chrome etc. TIG-205 is a rectifier adopting the most advanced inverter technology. welding power source can offer stronger, more concentrated and more stable arc. when stick and work piece get short, its response will be quicker. it means that it is easier to design into welding machine with different dynamic characteristics, and it even can be adjusted for specialty to make arc softer or harder. 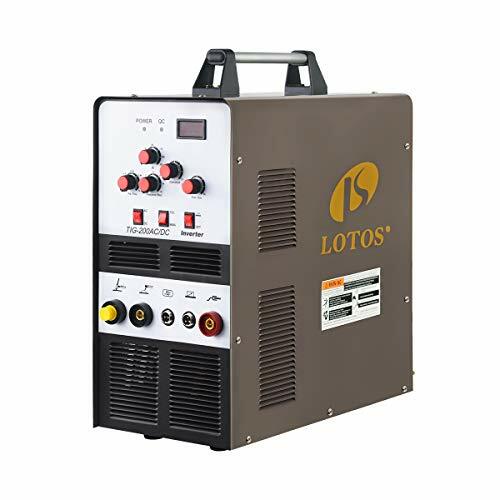 Processes is TIG (GTAW), Stick, Arc, Input Power is 115/230V/1phase/50-60Hz, Rated Input Power is AC 230V/7.5KVA/33Amps and AC 115V/4.6KVA/40A, TIG Current Range is AC 230V/DC 18.0V/15-200A and AC 115V/DC 15.8V/15-145A, Stick Current Range is AC 230V/DC 18.0V/15-180A and AC 115V/DC 15.8V/15-130A, 60% Duty Cycle at 200A, Forced Air Fan Cooling, HF& High Voltage Start, Usable Electrode: Ф1/16″-3/16″, 93% Power Factor, Size: 16×6.5×12 in. Weight: 16 Lbs. Packaging Size: 19×10.2×13.6 in. 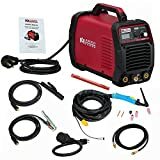 Packaging Weight: 27 Lbs.Included:TIG-205 TIG & Stick Welding Machine, 13 Feet Professional TIG Torch Gun, 10 Feet Electrode Holder and Cable, 10 Feet Work Clamp and Cable, 8 Feet Argon Gas Hose, 115V & 230V Power Cord Adapter. As the latest addition to the analog line of inverter TIG welders from Everlast, the PowerTIG 200DV features all of the same dynamic performance of the PowerTIG 200DX, but expands its versatility by adding dual voltage and a digitally controlled IGBT inverter. Able to operate on 120V or 240V single phase 50/60Hz, the unit offers maximum go anywhere performance. The unit is definitely portable, and can be used with any generator that is rated for a sustained 3500 watts (120V) and is certified by the manufacturer as “clean power”. 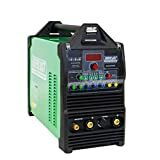 If you need a reliable, TIG welder that you can carry with you and make quality welds day-in and day-out, the PowerTIG 200DV is definitely one to consider. Includes: 12 ft. Everlast 26 Series TIG torch with 35 series DINSE stle connectors and torch switch for 2T/4T operation Stick electrode holder with 10 ft. cable and 35 series DINSE style connectors Work clamp with 10 ft. cable and DINSE style connectors Foot pedal Everlast regulator made from billet brass 240/120V Pigtail Adapter 6 ft. Power input cable Consumable Starter Kit (Tungsten not included) Minimum/Maximum: TIG: Weld steel to a maximum of 5/16″ single pass (240V) Weld steel to a maximum of 3/16″ single pass (120V) Weld steel to a maximum of 1/2″ multi-pass(240V) Weld steel to a maximum of 3/8″ multi-pass (120V) Weld aluminum to a maximum of 1/4″ single pass (240V) Weld aluminum to a maximum of 1/8″ single pass (120V) Weld aluminum to a maximum of 3/8″ multi-pass (240V) Weld aluminum to a maximum of 1/4″ multi-pass (120V) Weld to a minimum of .007″ Steel Weld to a minimum of .020″ Aluminum Stick: Weld with a minimum of 1/16″ diameter electrode Weld with a maximum of 1/8″ diameter electrode (240V) Weld with maximum of 3/32″-1/8″ diameter electrode (120V) TIG limits are recommended based off of practical limits and industry recommended standards for single and multi-pass welds.